The Coastal Bend is one of the only places in the United States to view endangered whooping cranes in native habitat. While the annual Whooping Crane Festival is held in Port Aransas, the actual birds are usually a few miles farther up the coast at the Aransas National Wildlife Refuge. This year, two whooping cranes were spotted in the Port Aransas Nature Preserve at Charlie’s Pasture. It is the first known sighting of whooping cranes in Port Aransas, a possible sign the endangered flock is growing in both size and bravery. The whooping crane is the most endangered of the 16 species of cranes in the world. In 1941, fewer than 20 of the birds remained in the wild as the species edged extinction. In 2017, the whooping crane population reached a record high of more than 400 birds. The number of young hatched in the birds’ summer home reach a record high this year as well. The Coastal Bend whooping cranes are the only group of naturally migrating cranes in the world. They are also the tallest birds in North America, standing at a whopping 5 feet. They are a stunning, solid white, except for their black-as-ink wingtips, which are visible only when in flight. 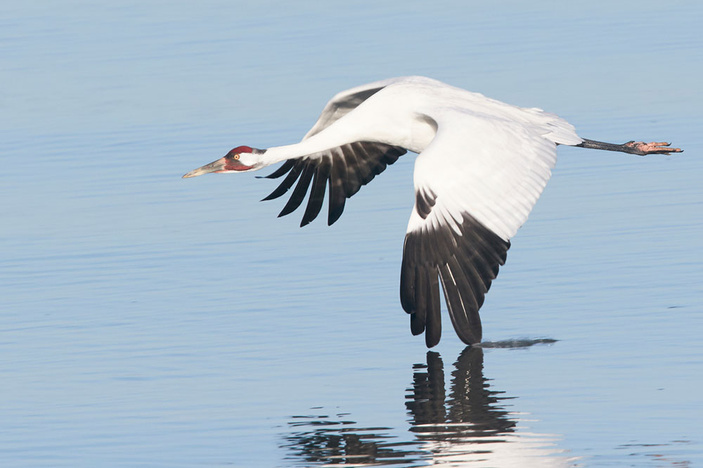 Whooping cranes migrate to the Coastal Bend in late October and early November. The annual Whooping Crane Festival is held each February before the wintering cranes return to their summer home in Wood Buffalo National Park in Canada. Bird watchers from around the world are attracted to the Whooping Crane Festival. From novices to expert birders, everyone can take part in the workshops, lectures and other activities. Available are both land and sea birding tours led by professional birders. Public speakers discuss everything from nature photography to conservation to political issues, while workshops are held on how to identify birds and use binoculars. In addition to the weeklong festival, the Bird’s Nest Nature-Related Trade Show is filled with booths presenting everything from bird feeders to fine art. The Whooping Crane Festival is held every February. For more information, visit whoopingcranefestival.org.